Refinance With Cash Out Today! We are available to answer questions and ready to get you pre-approved. Connect with your own personal Mortgage Broker now. 24 Hour Mortgage Broker Hotline (888)416-4805. What loan program are you looking for? In what city is the property located? A cash-out refinance is a refinancing of an existing mortgage loan, where the new mortgage loan is for a larger amount than the existing mortgage loan, and you (the borrower) get the difference between the two loans in cash. Basically, homeowners do cash-out refinances so they can turn some of the equity they’ve built up in their home into cash. 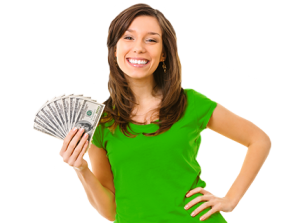 Typically, you can use the cash you get from a cash-out refinance on pretty much anything you want, be it paying down your credit card debt or taking a vacation. In practice, however, some uses of the money are smarter than others. If you have high interest debt such as credit cards, it may make sense to use a cash-out refinance to pay off this debt (do the math to make sure the all-in costs, including the closing costs for the cash-out refi, work out), because the interest you pay for your credit card likely far exceeds the interest on your new mortgage loan. In doing this, you get other perks, too: You may boost your credit score by paying down your maxed-out credit cards, and you can get a tax benefit from moving the credit card debt to mortgage debt because you can deduct mortgage interest on your taxes. It may also make sense to use this money to do home improvements, which can boost your home’s value down the road. Just remember, no matter what you use the cash for, it’s risky: You could lose your house if you don’t repay the new mortgage loan amount. A homeowner who owes $80,000 on a home valued at $200,000 has $120,000 in equity. That equity can be liquidated with a cash-out refinance loan providing the loan is larger than $80,000. The total amount of equity that can be withdrawn with a cash-out refinance is dependent on the mortgage lender, the cash-out refinance program, and other relative factors, such as the value of the home. How Does A Cash Out Refinance Differ From A Home Equity Loan? A home equity loan is a separate loan on top of your first mortgage. A cash-out refinance is a replacement of your first mortgage. The interest rates on a cash-out refinancing are usually, but not always, lower than the interest rate on a home equity loan. You pay closing costs when you refinance your mortgage. Generally, you don’t pay closing costs for a home equity loan. Closing costs can amount to hundreds or thousands of dollars. NMLS 222269, Serving Colorado, Florida MBR2455 & Illinois. Smart Mortgage Centers (888)416-0920 Smart Mortgage Centers is Regulated by the IDFPR 100 W Randolph St, Chicago, IL 60601 Ph: (888) 473-4858. Mailing address: 1942 Broadway St. Ste 314C, Boulder CO 80302. © 2019 Copyright Smart Mortgage Centers. All rights reserved.